Yui has one weird fetish. But hey, who doesn't love money? By now I've realized that I never really had a problem with the slice-of-life aspects and most of the abject silliness that the series has. In that sense I guess all I really complained about was a certain specific aspect that for me plagued the first season that is surprisingly toned down for the bonus episodes and for S2 so far. And yes I actually have a habit have slapping money on my arms when I get a good lot, sort of like Yui, just not in a dreamy-fetish sort of way on my face. There's a surprising lot of lamentation and brooding this season so far, a counterpoint to the usual silliness of ASTT (is it wrong to abbreviate them? ). Just like bonus Ep13 the show can definitely handle serious moments when they have to, and while the turtle gift pretty much blew up in their faces it felt like a very sincere gesture nonetheless. I can tell that the member issues and them being seniors will probably play a very big part in this season. Hell I'm already liking these two episodes than half of season 1 combined. This second episode of K-On!! is definitely better than the first one, better pacing, better comedy and the animation quality is quite consistent in my opinion for the last 2 episodes which is a good thing. As for the OP and ED songs, I just can't get them out of my head anymore and I already forgot what the K-on! first season's OP&ED sound like?! 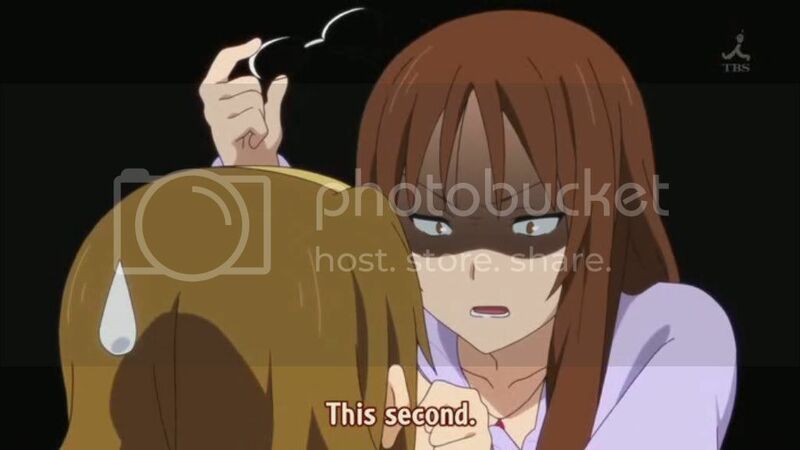 As for the second episode itself, it's really well done, especially when Ritsu put the receipt into her mouth and try to prevent Sawa-chan from getting it; this scene is actually better (thus funnier) done than in the manga in my opinion. And Ric-chan, nice catch! 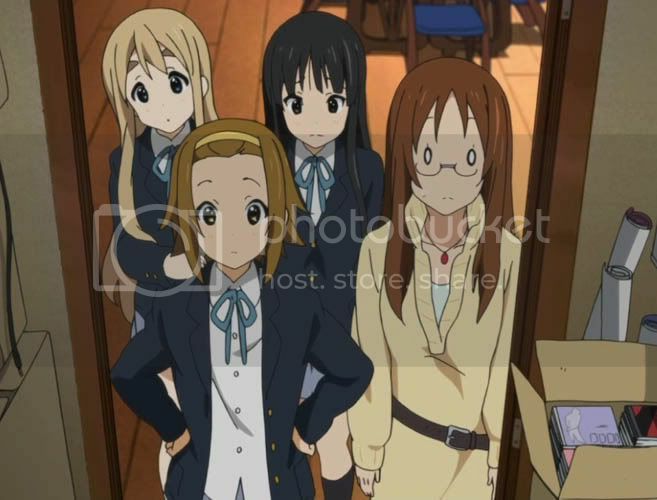 - Yui let some breakable porselain teaset to fall after hearing the origin of the teaset they are talking about. Nice episode and looking forward to the next episode! Nice to see that Budokan is still on their minds. Damn, that was a LOT of fries Ritsu bought, especially considering that the others all got their own. Rockin'an: Your guide to such bands as "Greeen Day" and "The Onspping". -"I never thought I'd lose four times in a row..."
"Why is that guitar worth so much? Are you sympathizing with Mugi?" -"One of you freshmen, please take me to the..."
"Wow, we really blew it"
Nice added touch on the aquarium and hardware store with lots of neat backgrounds. I can't help but to think that KyoAni didn't lazy around on animation department. 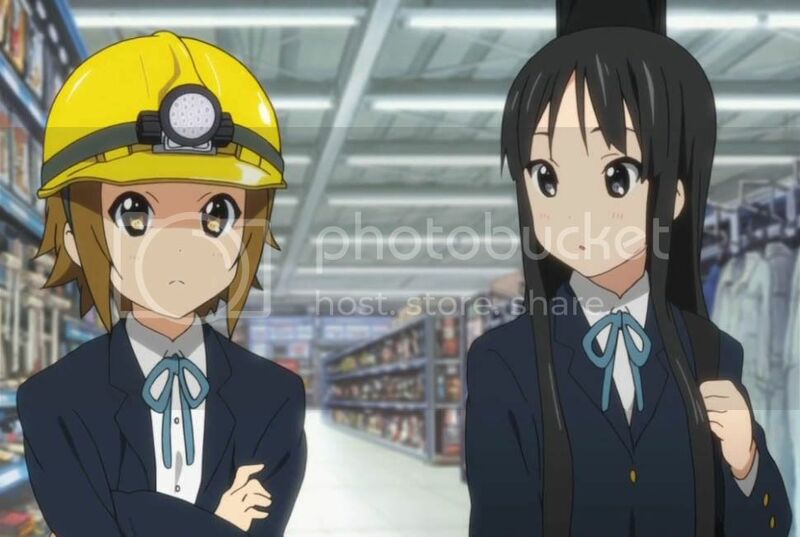 My favorite was the moving escalator behind Mio and Azusa in the music store. It's not like anyone would've complained if it hade just been a wall behind them, but they added a little touch like that anyway. - Mr. Saturn being taken by Mio. - Mugi's fascination of a commoner's department store. 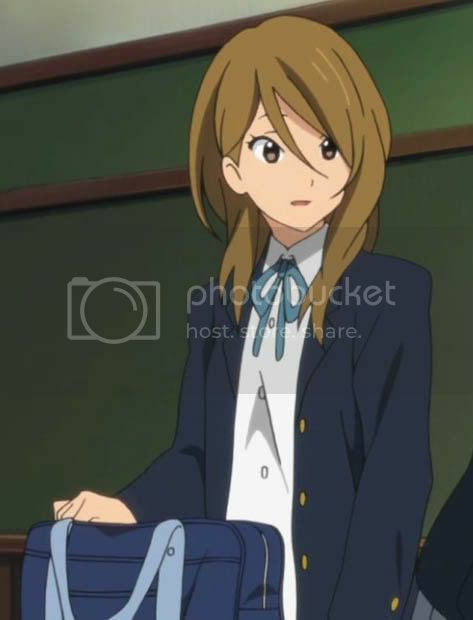 - All but Mugi wondering what to do with all that money. - Azusa's cute fascination with their new unofficial mascot of Keion-bu. - Was that Yui in the preview with chopsticks standing over the new turtle? LOL I hope not. Above all, need more shots of Mio in ponytail. But, Ritsu was very entertaining to watch this episode. LOL @ Yui being a money masochist. 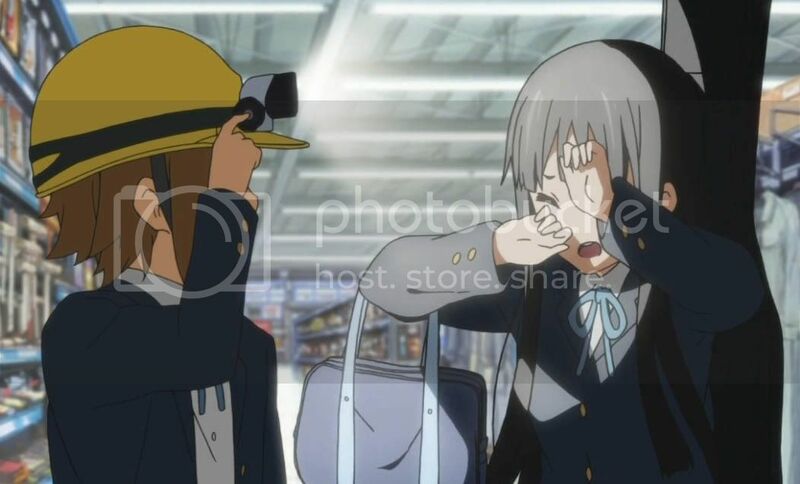 I absolutely loved the part where Ritsu blinded Mio with that helmet. They've struck a really good balance between character and comedy in this series so far. Lots of really amusing moments in this one: Yui's masochism; Mugi's delight in polishing taps; Ritsu eating the receipt as the others cheer her on. It's interesting that an overall theme is forming (Azusa being left alone at graduation), too. Can't wait to hear some new music, though! "I will never give up on you, for all the times you've sat and sang to me, trying to make me better. So now, I'm trying to let you know that this is the English way to make us all fit back together..."
Ahh, this is why I enjoy this series so much in spite of itself. There's something to be said for series where you can just unplug your brain and enjoy. Mugi in the store was sheer hilarity. I love seeing her reactions to everything in the "normal" world. Conversely, her lack of reaction to the sale price of the guitar was also awesome. I have to admit, Ritsu is really growing on me this time around. I'm looking forward to next week's ep being focus on her. Another fun ep all around, and I agree the animation seems better than the first season here too. 8/10 for me. Now it's time to sit back and wait for next week. It's also time to see if anyone gives me negative rep points this week just for my liking K-ON!! like they did last week. It's so precious to see anime elitists taking their cheap shots wherever they can. Click to visit my Fanfiction.net profile with all my stories. Evil Sawako... and I thought she had disappeared forever. Cross Game - A Story of Love, Life, Death - and Baseball. What more could you want? wow. 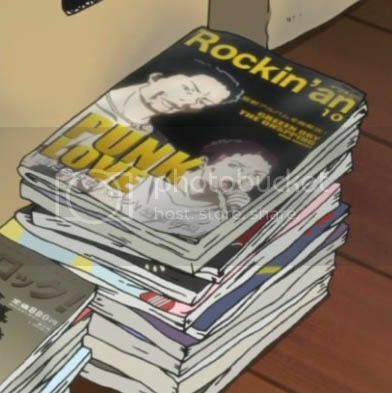 any of you guys notice this? Ritsu will be shining next episode? But she's been shining since Season Two started, how much does she want to shine? Like the sun...or an atomic explosion? The propensity of the Internet to fixate upon the tiniest of details and pitch it as relevant news continues to astound me. "Funny-looking hands! Wrong-coloured socks!" That's the true "wow" here. The sound of thousands of unnecessary wasted page hits was heard and then silenced. Hate it that to even critique the site that I would have to visit it and reward such nonsense with page hits. Anyway.... you know, this isn't that *great* of a series but I just swim in it when a new episode comes out. The art, colors, sound, voicing, music all hit the brainstem -- more evil than Mugi's drug cakes. Liked the character exposition/evolution, the Mugi-in-walmart, shiny spoons, This episode and next seems to have Ritsu focus, nice. So far both episodes have been positively dripping in the memes of change, transition, transience.... they're going to grow up, they're going to graduate, can't stop it. Loved it. I thought it was funnier than the first episode. It ended with the warm fuzzy feeling that makes me want to cry. Call me easily pleased if you like, but I gave it a 10. Good episode. I really liked Azu-nyan this episode and I kind of felt sorry for her considering that K-on is seemingly the only club that didn't recruit any new members. I love the way they made up for it though, that turtle is awesome! Lol @ Yui in that painter outfit. 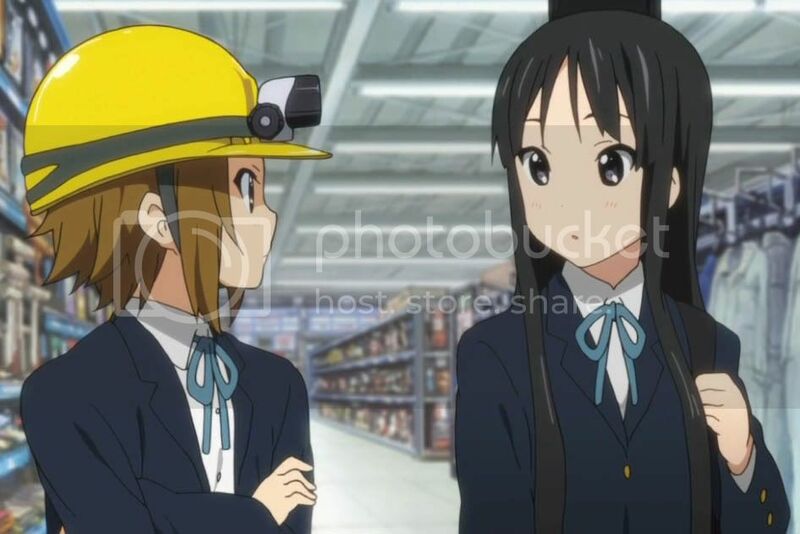 Especially when Ritsu called her a kid... as she was wearing a hardhat lol. Overall, a pretty funny episode. For the poll, I'm going to rate it the same as last weeks ep. An 8/10. Although the shopping sequence also puts me in mind of episode 2 of Gakuen Utopia Manabi Straight!. Yui "crushed" Sawa's innocence just like that.